Why did they ask if they weren’t going to listen? 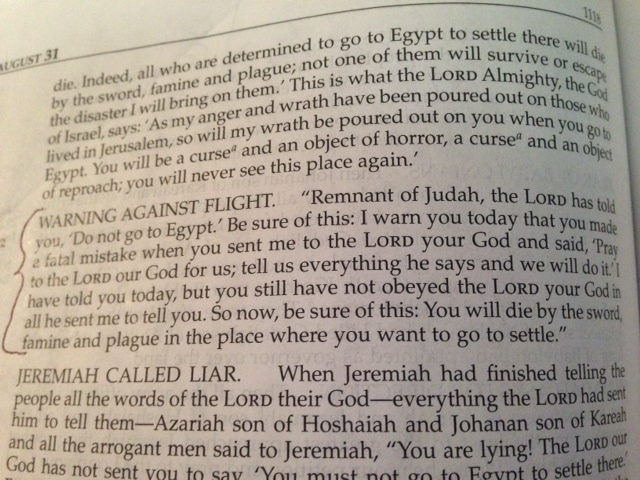 So Jeremiah asked God and he told the people of the remnant to stay where they were – do not go to Egypt. They would die by the sword there. The people went to Egypt anyway. And the swords of their enemies killed them. If they were just going to do what they wanted, why go through this ‘big show’ of asking God? 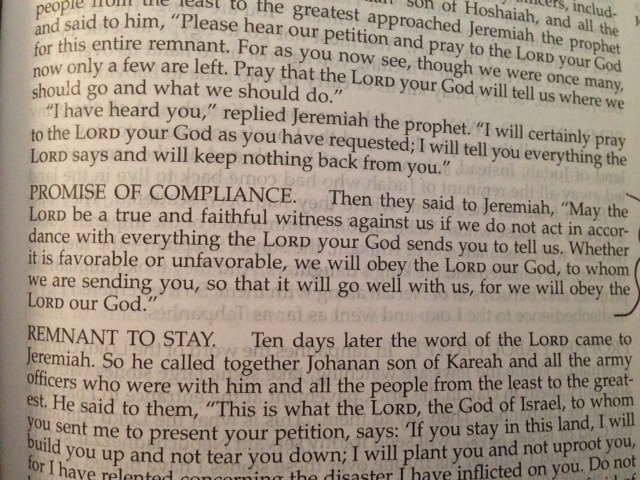 We see a clue to their behavior when they tell Jeremiah that they will do everything the Lord your God tells them to do. Later they changed that to ‘our’ but – which one is it? We can tell by their actions that our Lord God is not their Lord God. They didn’t listen to him. He told them exactly what to do and what not to do and they did what he said not to do. He obviously was not the Lord of their lives. If we say anything else, we are not making him Lord of our lives. It’s as simple……and as challenging…..as that. Please help us always make you Lord in our lives, dear Jesus.